Breach by W.L. Goodwater is a novel taking place in the aftermath of World War II, where the remaining powers fight with magic as well as conventional means. This book is apparently the first in a series. For a few years now I have enjoyed novels featuring magical fantasy. I don’t read them often because I’m very picky about the genre, which is why I believe that I enjoy the few that I read. Breach by W.L. 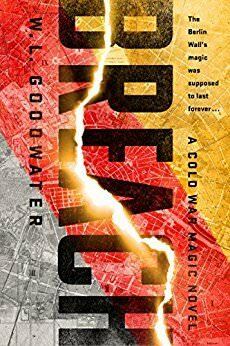 Goodwater combines several genres which I enjoy reading about: magic, World War II, geopolitics, and espionage. I thought this novel was very entertaining. The author managed to find a balance between telling a story and sending a message, or making a point, without hitting the reader over the head with it. The plot has a lot of moving parts, not all of them come to an end, but I’ll chalk that up that it’s the first in a series. The characterization, I felt, was pretty good. The author introduced a lot of people, but managed to only develop a few, err on the side of length, I can only assume. I enjoyed the world building of this alternative history book. The author got the vibe and feel of post World War II espionage novels, while giving it a new spin. A young American magician with the Office of Magical Research and Deployment named Karen O’Neil has been tasked to go to Berlin and help the CIA figure out why the Berlin Wall is starting to breach. As it turned out, the wall is made by very strong German/Soviet magic and it’s in all the governments’ best interest to keep it in tact. Dis­claimer: I got borrowed this book from a friend.